Note: You can enter this giveaway one (1) time per e-mail address per day. Deadline is 11:59PM ET 3.8.18. Would you cook more if you knew the recipes not only would work, but were also simple to make? 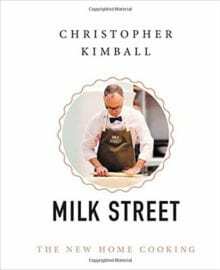 If you answered yes, Milk Street from Christopher Kimball is your cookbook. This collection of more than 125 recipes connected to public television’s Milk Street show, covers dishes from grains to salads, simple dinners and desserts. Recipes such as Japanese fried chicken, rum-soaked chocolate cake, Thai-style coleslaw, and Mexican chicken soup all deliver big flavors without using hard-to-find ingredients, strange cookware, or all-day methods. Recipes like these and the ones in our Easy Peasy Recipes slideshow are sure to change the way you think about cooking and how often you cook. NO PURCHASE NECESSARY TO ENTER OR WIN. Void where prohibited by law. Open to legal residents of the 50 U.S., D.C. and Canada (excluding Quebec) who are at least eighteen years old at the time of entry and have internet access. Begins on 2.15.18 at 12:00:00 a.m. ET and ends on 3.8.18 at 11:59:59 p.m. ET. To enter this giveaway, submit your full name and email address on this form. Odds of winning this giveaway depend on the total number of eligible entries received. Only one (1) entry per email address per day. Sponsored by Leite’s Culinaria, Inc. For more information, visit our Official Rules. For a list of winners, check out our Very Happy Winners page. Be sure to add giveaways@leitesculinaria.com to ensure notification if you are the winner.